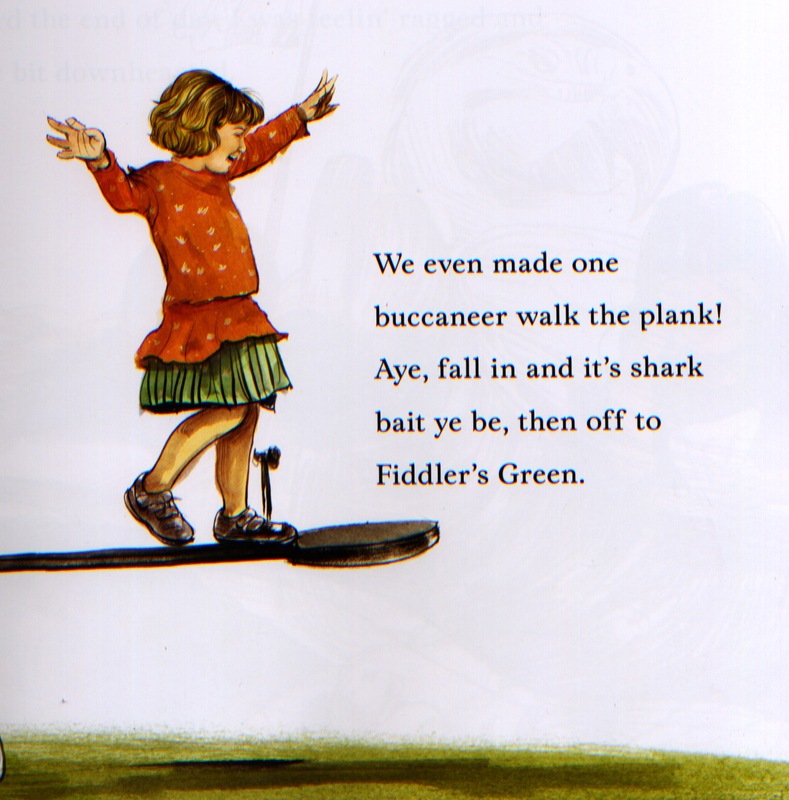 Thank you Cindy Dobrez and Lynn Rutan, writing for Booklist Online, for the kind comments about A Pirate’s Guide for First Grade. Cindy and Lynn take a collaborative, two-headed approach to book reviews, giving the traditional book review the old Siskel & Ebert update. I think it’s a cool idea that works — and that might even work best when they disagree. For the full review, please click here or walk the plank. Your choice. Cindy notes the book includes a nod to libraries, but I’d also like to echo her thoughts and give a nod to nods. I could use a nap myself! Detail from double-page spread, art by Greg Ruth. Wish I could scan the whole thing, since the facing page is so much fun, but I can’t, so there you go. James, thanks for spreading the word about Bookends. Lynn and I really do need to disagree more in the blog, the problem is that our focus is to highlight books we recommend and we do have some similar tastes in books. We’ll work on it. I like your teaser with the walking the plank spread, too. I decided not to post it on our blog for the very reason that I couldn’t get the whole double-page spread, but it is good enticement for folks to hunt down the book to see the whole thing. Naps all around! We’ve earned them. Thanks, Cindy. I know what you mean about the disagreement, but I do think that’s the key element to all those successful point/counterpoint shows we see on television (particularly in the realm of sports and politics). Maybe there’s an element of a book that’s up for debate, or a degree of disagreement. But I can certainly see your dilemma, since you are all about sharing enthusiasms. And thank you for that! One last thing: I think there are constructive, thoughtful ways of voicing critical reactions to a book. The key is to keep the standards high, but leave the snark behind.